WHU is an exciting place to be. Modern, diverse, and international — Student life at WHU. The WHU spirit is a term you may have already come across, and it is certainly one you'll hear again once you're on campus. Student life at WHU isn't just about studying - in their free time, our students enthusiastically pursue a wide range of extracurricular activities, making campus an exciting place to be no matter what your interests are. WHU’s goal of providing new direction to German business and management education is spread across two locations, Vallendar and Düsseldorf. 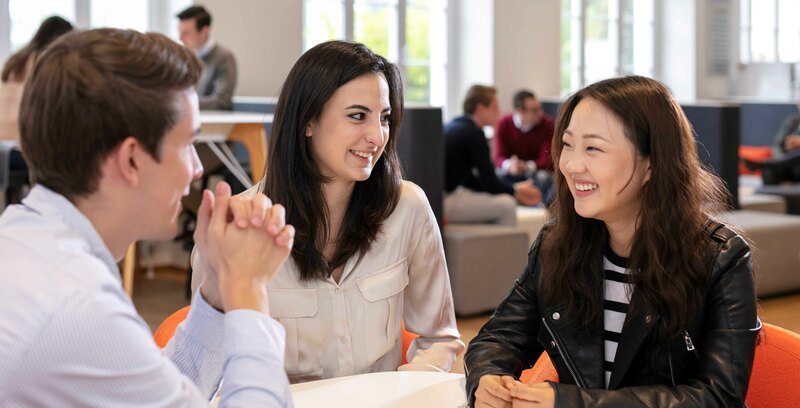 Our Bachelor (BSc), Master (MSc), Kellogg-WHU Executive MBA, and Doctoral programs take place in Vallendar, while our Full-Time MBA, Part-Time MBA, and Executive Education programs are held in Düsseldorf. Vallendar is located in the Upper Middle Rhine Valley. With its castles, historic towns, and towering vineyards, this section has been awarded UNESCO world heritage site status. Major cities are dotted along the banks, and Koblenz marks the meeting of the rivers Rhine and Moselle. Perfectly placed, Vallendar and its surrounding area offer plenty to see and do. Düsseldorf is the capital of the state North Rhine-Westphalia and is located on the banks of the river Rhine. Its 600,000 inhabitants make Düsseldorf a vibrant and international city in which to live, study, and work. Presenting a wide range of extracurricular activities. Student life at WHU is not just about studying. In their free time, our students enthusiastically pursue a wide range of extracurricular activities, making campus an exciting place to be. Whether you love sports, the theater, music, entrepreneurship, the community, debating, or wine tasting, there is something for everyone. Take a look at our full list of student clubs to discover just how diverse student life at WHU is. The WHU New Year's Conference is an international finance conference that engages students, academics, corporate representatives and politicians in the discussion of contemporary topics. Diversity at WHU is a student-group concerned with bringing diversity- and LGBT-related topics into daily campus life. The group interacts as an intermediary to allow an exchange of personal experiences. Established as Europe's premier student-led founders' conference, our annual event unites experienced founders, vcs, investors as well as ambitious students for the interactive exchange of ideas and experiences. Ever since 2010, our event has been a unique platform for more than 200 international students, entrepreneurs, young professionals, and investors. SensAbility aims to make social activities more entrepreneurial and entrepreneurial activities more social. We combine sports competitions, legendary theme parties and a great opportunity for getting in touch with company representatives supporting the event. WHU Studenten Helfen e.V. intends to give something back to the community, e.g. via collecting donations at the annual charity concert and doing regular projects concerning the community in Vallendar. More than 35,000 books, journals, and databases. The WHU library offers an excellent research infrastructure to academics and students of WHU on a 24/7 basis. The library's reading room offers a quiet atmosphere for studying newspapers or for concentrating on a specific academic publication. Fostering the personal development of our students. The General Studies module aims at educating reflective and responsible-minded leaders who are able to find outside-the-box solutions to socio-political and entrepreneurial issues. The module offers a forum, a speaker series, and various seminars.